Mayan hot chocolate at DB Infusions comes blended with chilis and ground corn. There are 10 varieties of hot chocolate at Sjölinds Chocolate House. They include a Norwegian blend with peppermint, Mexican with honey, cinnamon and hot peppers, a German cocoa with gingerbread spices and an Italian version with orange zest. 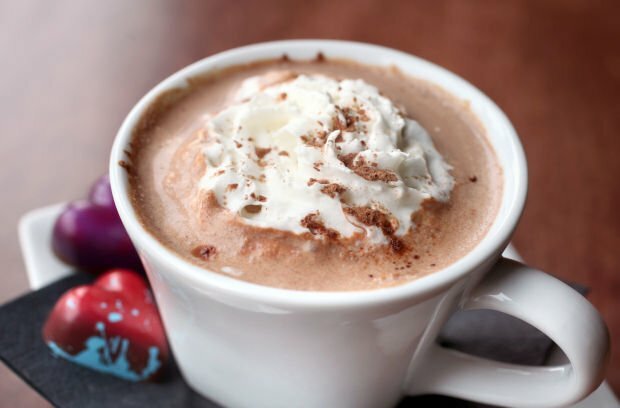 Barriques makes its hot chocolate drinks with Omahene cocoa, imported from Ghana by a Milwaukee-based company. Its Mexican version is spiced with cayenne powder and sweetened with vanilla. Gail Ambrosius on Madison's east side keeps the hot chocolate warm all winter in its small storefront. The base is dark, fruity Colombian chocolate, topped here with homemade marshmallows. Techniques for battling the Polar Vortex abound. Whether it's chopping firewood (heats you up twice! ), hibernating or heeding your mother's advice and putting on another sweater, the cold must be held at bay one way or another. Hot chocolate is a critical tool in the Midwestern arsenal for maintaining core body temperature in the face of a February clipper. Fortunately for Madisonians, the days of watery powdered cocoa with desiccated mini-marshmallows can be buried firmly in the past with a selection of enough drinkable (and cocoa-inspired) delectables to carry you into the spring thaw. Drinkable chocolate has its roots in South America; it was brought to Europe by Don Hernán Cortés, who got it from the Aztecs. DB Infusions, known primarily for its jewel boxes of truffles, gives a nod to hot cocoa's roots with its Mayan flavor of house-made drinking chocolate, which comes blended with chilis and ground corn. "We have three different chili peppers in the Mayan," said owner Ann Culligan, "ancho, pasilla and chipotle peppers. And we do have polenta in it. It adds a depth of flavor to it and an interesting mouthfeel." The Madras drinking chocolate combines DB Infusions chocolate with black pepper, curry and Vietnamese cinnamon. The chocolate can be purchased made-to-order by the cup ($4) at DB Infusions' Hilldale storefront, or bought as a mix to make at home ($9.50 for a bag that makes roughly five servings). 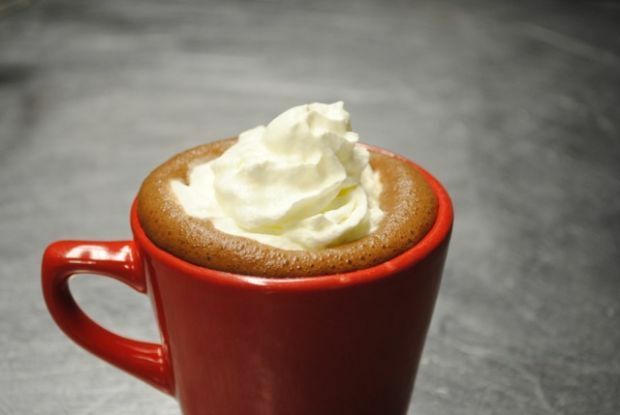 Mexican-style hot chocolate — spiked with chili and sometimes cinnamon — makes an appearance elsewhere on Madison-area café menus. Because Barriques is that rare establishment that serves both kid-friendly cocoa and adult-friendly alcohol, it's possible to customize your cocoa drink with a shot of Kahlua, Bailey's Irish Crème, amaretto, or peppermint schnapps for an adult update of the childhood staple. For an even stronger Mexican kick, you can migrate over to the colder side with Callope Ice Cream's Mexican Hot Chocolate flavor. Manager Staci Fritz described its flavor as inspired by "the wedges of Abuelita brand [chocolate] I have at home." In this case, the word "hot" refers both to the temperature of the Mexican drink whose flavors are the inspiration, as well as the capsaicin kick Calliope's ice cream provides. "We use chipotle powder and white pepper, and it's definitely noticeable," Fritz said. Find Calliope at Ian's Pizza restaurants, Stalzy's Deli, Jenifer Street Market, Next Door Brewing Co., the Weary Traveler and several other locations. For sheer variety and scope, there's no place in the greater Madison area that offers more varieties of hot chocolate than Sjolinds Chocolate House in Mount Horeb. According to barista Ty Thiessen-Barta, Sjolinds has 10 different varieties. "The Norwegian has peppermint and the Mexican has honey, cinnamon and hot peppers," he said. "The German has gingerbread spices. The Italian is dark chocolate with orange zest. The French is very dark, with vanilla bean." There are also Brazilian (coffee and hot chocolate), West Indies (ginger, peanut butter and allspice), and Icelandic (white chocolate) variations, as well as the "All-American" milk and dark drinking chocolate. On Madison's east side, Gail Ambrosius Chocolatier keeps the hot chocolate warm all winter at its small storefront. To take home, a one pound bag is $18 and contains dark, fruity Colombian chocolate, to be melted on the stovetop with a little bit of water and then whisked with milk. The heaviest hitter in town, however, has got to be Chocolaterian, which serves a Parisian-style hot chocolate that's basically cacao rocket fuel. Owner Leanne Cordisco was inspired to create Chocolaterian's signature drink by visiting patisseries and chocolate shops in the City of Light. "An American-style hot chocolate is one part chocolate to eight parts dairy. Ours is about 50/50," she said. "What you end up with is this luxurious mouthfeel. It coats your palate." The thick drink is served in a wee mug with a heavy demitasse spoon, with no whipped cream to dilute its dense, bittersweet richness. "We know that someone has really enjoyed it when they take the little spoon and they scrape and scrape," said Cordisco.